Here are a few pieces of media that feature The Freq Zone. We will be adding more when they become available. If you are looking for artists and music we have worked on check out our Work page. Nathan talks about mastering and audio gear at Winter NAMM 2017 with Dangerous Music. Covering various topics and answering questions from the audience. The Freq Zone is featured in December 2016 issue of MusicTech Magazine. 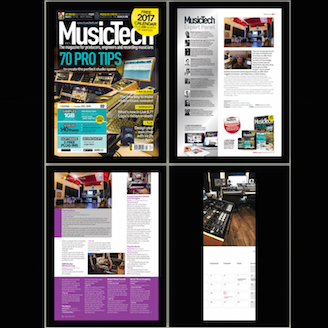 In the magazine, Nathan gives tips for studio owners and the studio is also featured in MusicTech's 2017 calendar. We are July, what a fun month. Nathan does an interview with Audiofanzine. In the interview, he discusses his views on mastering, audio gear, and The Freq Zone. Read it here. A longer form interview where Nathan talks about The Freq Zone and Dangerous Music gear. You can view the article here. In this release, Nathan talks about The Freq Zone and his use of Dangerous Music gear. Nathan discusses the studio as well as his points of view on certain pieces of gear. Read it here. Our video we did on Vocal Compression published on Sonic Scoop. We showed how to get massive amounts of gain reduction while tracking vocals with the Dangerous Music Compressor. You can view the article here. The Freq Zone was featured in MusicTech Magazine's January 2015 edition. This was shortly after construction was done but before we opened our doors as a commercial studio. They still use the image of the studio when they talk about acoustics which makes us very happy.